Is Peanut Butter Good For Hamsters? 22 foods hamsters can & can't eat! Can Hamsters Eat Peanut Butter? 22 Foods Hamsters can (& can’t) eat! Peanut butter can be consumed by hamsters and is best offered as a snack or a treat. Because of the high, healthy fat content, the best method to serve peanut butter is by smearing a small amount on its main meal or even mixing it up in another feed. Alternatively, you can also spread a thin layer on a piece of wood for the hamster to gnaw on. Can hamsters eat Peanut Butter? In moderation! Peanut butter contains a lot of the same vitamins as peanut (naturally). These are vitamin B, vitamin E and niacin. 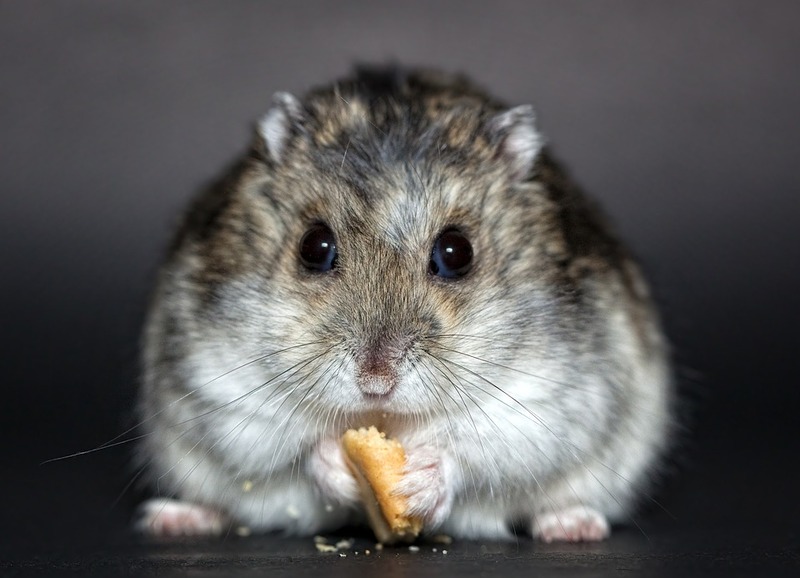 Caution must be taken when feeding your pet with peanut butter to avoid the peanut butter getting stuck in cheek pouches, which can cause severe problems for your hamster. It is not advisable to directly feed plain peanut butter to your hamster. What others treats can I give my hamster? … and watching your hamster feast on its treats is sure to give you a warm and even proud feeling! If you’re ever unsure about feeding your hamster a particular food, just don’t do it. Likewise, if your hamster ate something you’re not sure about, call your vet. 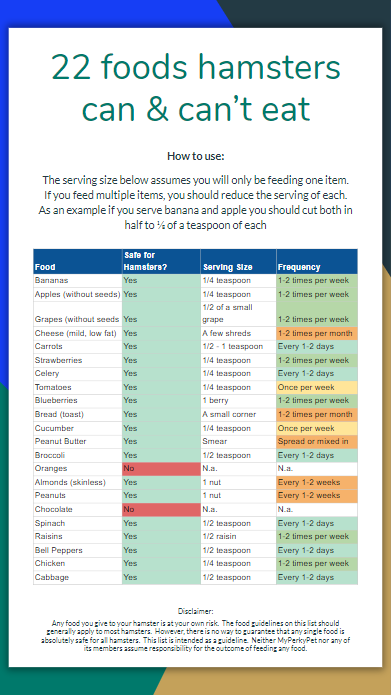 ​To answer the most common items given as treats (and some items not to give you hammy) we’ve put together a hamsterific infographic you can get below. When I introduce new treats for my Hamster, Mr. Bubbles, there is a 3-step system I use every time to ensure it’s good for his little stomach. Besides giving your hamster treats, it is very important to give it the right kind of hamster food. That’s why, we have done the research and recommend the following three products, that are none of the above, and instead are the backbone of a good hamster diet. Interested in other treats for your hamster? 1. Provide fresh water every day. The water bottle should be frequently checked for any dirt or leaks to avoid contamination of the water. It is also good to monitor your hamster’s water intake because a reduction of water intake can mean you need to visit the vet. 2. Remove any remnants of feed to avoid rotting- this is especially for fresh fruits, vegetables, and powdered food which tend to grow mould / bacteria. 3. Do not overfeed on vegetables to avoid diarrhoea. Overfeeding on sugary fruits and treats is also discouraged because it tends to cause obesity in your pet. 4. When introducing a new kind of feed to your hamster, you should first give a small amount and observe for a week for any negative reaction to the food. If there is no negative reaction, then the feed is safe for consumption for your hamster. A sudden change in the diet of your pet may cause stress. You are now well equipped to start feeding all kinds of treats to your hamster. If you have any questions around any treat we have not covered please leave a comment below – we’ll be around to answer it. Previous Post Can Hamsters Eat Cucumber? 22 Foods Hamsters can (& can’t) eat! Next Post Can Hamsters Eat Broccoli? 22 Foods Hamsters can (& can’t) eat! Just a fair warning, when putting the peanut butter on a piece of wood. Ensure the wood doesn’t have any splinters or is large enough that it can’t break into small pieces. Lost my friend Nibbler because of this. Gaffer was just too good at nibbling. Very sorry to hear that and thanks for the input!